Ladies' Home Journal is an American magazine published by the Meredith Corporation. It was first published on February 16, 1883, and eventually became one of the leading women's magazines of the 20th century in the United States. From 1891 it was published in Philadelphia by the Curtis Publishing Company. In 1903, it was the first American magazine to reach one million subscribers. In the late 20th century, changing tastes and competition from television caused it to lose circulation. Sales of the magazine ensued as the publishing company struggled. On April 24, 2014, Meredith announced it would stop publishing the magazine as a monthly with the July issue, stating it was "transitioning Ladies' Home Journal to a special interest publication". It is now available quarterly on newsstands only, though its website remains in operation. Ladies' Home Journal was one of the Seven Sisters, as a group of women's service magazines were known. The name referred to seven prestigious women's colleges in the Northeast. The Ladies' Home Journal was developed from a popular double-page supplement in the American magazine Tribune and Farmer titled Women at Home. Women at Home was written by Louisa Knapp Curtis, wife of the magazine's publisher Cyrus H. K. Curtis.[when?] After a year it became an independent publication, with Knapp as editor for the first six years. Its original name was The Ladies Home Journal and Practical Housekeeper, but Knapp dropped the last three words in 1886. It rapidly became the leading American magazine of its type, reaching a subscribed circulation of more than one million copies by 1903, the first American magazine to do so. Edward W. Bok took over the editorship in late 1889, serving until 1919. Among features he introduced was the popular "Ruth Ashmore advice column" written by Isabel Mallon. At the turn of the 20th century, the magazine published the work of muckrakers and social reformers such as Jane Addams. In 1901 it published two articles highlighting the early architectural designs of Frank Lloyd Wright. Bok introduced business practices at the Ladies' Home Journal that contributed to its success: low subscription rates, inclusion of advertising to off-set costs, and reliance on popular content. This operating structure was adopted by men's magazines like McClure's and Munsey's roughly a decade after it had become the standard practice of American women's magazines. 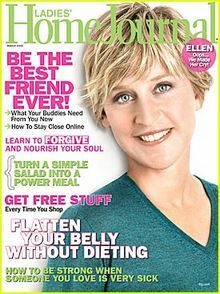 Scholars argue that women's magazines, like the Ladies' Home Journal, pioneered these strategies "magazine revolution". During World War II, the Ladies Home Journal was a particularly favored venue of the government to place articles intended for homemakers, in an effort to keep up morale and support. the annual subscription price paid for the production of the magazine and its mailing. The profits came from heavily advertising pitch to families with above-average incomes of $1000 to $3000 dollars in 1900. In the 1910s it carried about a third of the advertising in all women's magazines. By 1929 it had nearly twice as much advertising as any other publication except for the Saturday Evening Post, which was also published by the Curtis family. The Ladies Home Journal was sold to 2 million subscribers in the mid-1920s, grew a little during the depression years, and surged again during post-World War II prosperity. By the 1955, each issue sold 4.6 million copies and there were probably 11 million readers. In March 1970, feminists held an 11-hour sit-in at the Ladies' Home Journal's office. As a result, they were allowed to produce a section of the magazine that August. They wanted the magazine to recognize a wider variety of choices for women's lives. The Journal, along with its major rivals, Better Homes and Gardens, Family Circle, Good Housekeeping, McCall's, Redbook and Woman's Day, were long known as the "seven sisters", after the prestigious women's colleges in the Northeast. For decades, the Journal had the greatest circulation of this group, but it fell behind McCall's in 1961. By 1968, its circulation was 6.8 million compared to McCall's 8.5 million. Society was changing and this was reflected in persons' magazine choices. That year, Curtis Publishing sold the Ladies' Home Journal, along with the magazine The American Home, to Downe Communications for $5.4 million in stock. Between 1969 and 1974 Downe was acquired by Charter Company. In 1982 it sold the magazine to Family Media Inc., publishers of Health magazine, when Charter decided to divest its publishing interests. In 1986, the Meredith Corporation acquired the magazine from Family Media for $96 million. By 1998, the Journal's circulation had dropped to 4.5 million. Although the magazine remained very popular, it ran into increasing difficulty attracting advertising. Despite its high subscriber base (3.2 million), it was not a leader in the women's service category. These factors prompted the decision to end monthly publication. The magazine was relaunched as a quarterly. At the same time, the headquarters of the magazine moved from New York City to Des Moines, Iowa. Meredith offered its subscribers the chance to transfer their subscriptions to Meredith's sister publications. ^ a b Marco Santana (April 24, 2014). "Ladies' Home Journal to Cease Monthly Publication". Des Moines Register. Archived from the original on April 24, 2014. Retrieved April 24, 2014. ^ "Meredith Reports Fiscal 2014 Third Quarter And Nine Month Results: Local Media Group Delivers Record Revenues and Operating Profit for a Fiscal Third Quarter" (Press release). Meredith Corporation. April 24, 2014. Archived from the original on April 24, 2014 – via PRNewswire. ^ a b Cohen, Noam (April 25, 2014). "Ladies' Home Journal to Become a Quarterly". New York Times. ^ "Saturday Evening Post & Ladies Home Journal". Curtis Publishing Company. ^ "Ruth Ashmore" Dead: A Well-Known Writer Succumbs to Pneumonia, Following Grip" (PDF). The New York Times. December 28, 1898. ^ Waller-Zuckerman, Mary Ellen (Winter 1989). "'Old Homes, in a City of Perpetual Change': Women's Magazines, 1890-1916". The Business History Review. 63 (4): 715–756. doi:10.2307/3115961. ^ Emily Yellin (2004). Our Mothers' War. New York: Free Press. p. 23. ISBN 0-7432-4514-8. ^ Ward, "The Geography of the Ladies' Home Journal"
^ Gibson, Megan (August 12, 2011). "The Ladies' Home Journal Sit-In - A Brief History of Women's Protests". Time. Retrieved January 28, 2015. ^ Carmody, D. (August 6, 1990). "Identity Crisis for 'Seven Sisters'". The New York Times. p. D1. ^ "Revolt at Curtis". Time. October 16, 1964. pp. 93–94. ^ Bedingfield, R. E. (August 15, 1968). "Curtis Publishing Sells 2 Magazines; Downe Paying $5.4-Million in Stock". The New York Times. Business and Finance section, p. 54. ^ "Too Few Believers". Time. August 23, 1968. p. 67. ^ "Magna charter". Time. June 16, 1980. p. 70. ^ "History of Meredith Corporation". Archived from the original on July 3, 2006. ^ "Meredith Won't Tinker with Added Magazines". The New York Times (Late City Final ed.). November 25, 1985. p. D2, col 5. ^ Kuczynski, A. (November 9, 1998). "Some Consumer Magazines Are Getting Real". The New York Times. p. C1. ^ Botelho, Stefanie (January 10, 2012). "Ladies' Home Journal to Move to Reader-Produced Content Model". Folio. ^ Ives, Nat (January 9, 2012). "Ladies' Home Journal Lets Readers Write the Magazine". AdvertisingAge. ^ a b c Emma Bazilian (April 24, 2014). "Ladies' Home Journal to Cease Monthly Publication". AdWeek. Retrieved February 6, 2016. ^ Kathleen L. Endres; Therese L. Lueck (1995). Women's Periodicals in the United States: Consumer Magazines. Greenwood Publishing Group. p. 172. ISBN 978-0-313-28631-5. Retrieved February 6, 2016. ^ Bok, Edward William (1921). "30. Cleaning Up the Patent-Medicine and Other Evils.". The Americanization of Edward Bok. ^ "125 Years of 'Ladies' Home Journal': Food". Ladies' Home Journal. 125 (8). 2008. Archived from the original on April 13, 2010. ^ Traditionally, the wife's side of the story is told first, followed by the husband's side. ^ Weber, Bruce (September 8, 1992). "Dorothy D. MacKaye Dies at 88; Ladies' Home Journal Columnist". The New York Times. ^ Chapman, John, III. "William Ladd Taylor: Biography". W.L. Taylor, American Illustrator. Retrieved April 16, 2010. ^ Worley, Dwight R. (July 23, 2000). "Genetic Genius". Business. The Journal News. White Plains, New York: Gannett. pp. 2–D. Retrieved July 31, 2018 – via Newspapers.com (Publisher Extra). Part 1 of the article appears at https://www.newspapers.com/clip/22386499/genetic_genius_part_1/ . Kitch, Carolyn. "The American Woman Series: Gender and Class in The Ladies' Home Journal, 1897." Journalism & Mass Communication Quarterly 75.2 (1998): 243-262. Knight, Jan. "The Environmentalism of Edward Bok: The Ladies' Home Journal, the General Federation of Women's Clubs, and the Environment, 1901-09." Journalism History 29.4 (2004): 154. Mott, Frank Luther. A history of American magazines. vol 4. 1885-1905 (Harvard UP, 1957) pp 536-555. covers Ladies Home Journal.